Get the many benefits of laughter in your life! 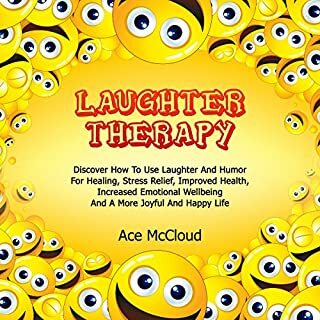 This book covers an incredible variety of strategies, techniques, therapies, and lifestyle choices that can help bring more joy and laughter into anyone's life. Life is so much more enjoyable when you actively try and incorporate laughter and humor into it. Don't just wish for it to happen, make it happen. There is a large variety of techniques and strategies that you can do every day to reduce stress, reduce anxiety, and live with much more joy and happiness! Great way to get more laughter in your life! Are you ready to start living a comfortable and happy life? Want to know how to transform your home into a refreshing paradise? 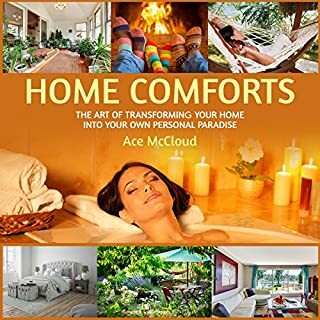 Whether you want to (1) enjoy the incredible comforts of a modern home, (2) make yours the place everyone loves to visit, or (3) have a delightful safe haven of your own, this audiobook will teach you everything you need to know to start living like a king or queen in your own home. How long has it been since you felt truly happy? Do you long for joy to fill your heart? 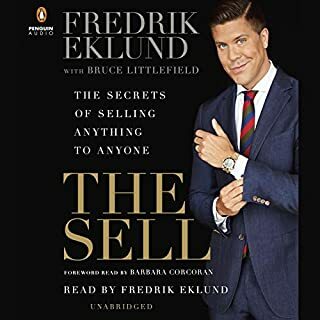 Whether you want to (1) defeat fear and dread, (2) learn to look on the bright side of life, or (3) find a way to stop feeling so miserable, this audiobook will teach you everything you need to know. Is the drudgery of your life keeping your spirits low? Happiness is an emotion we all welcome. By focusing on the four main core areas of life - health, relationships, career, and personal development - you will learn how to easily bring more happiness into your life on a consistent basis. Strategies in this audiobook will help you re-fill your glass each day with happiness, so you can maintain your emotional joy over the long term. Experiments have shown that smiling increases your happiness. This audiobook covers a variety of body movements and smiling techniques that will have you feeling great each day. Happiness is - ultimately - your choice. 40% of our happiness is not determined by genetics, nor by our circumstances; it is completely under our control! As you continue exercising your happiness muscles, you will be building habits that lead to a consistent state of happiness. You can be filled with hope, even in difficult times. I'd be lying if I said we can feel happy 100% of the time; some experiences just call for anger or grief. However, you can balance your inner life so that happiness is your default mode, the way you feel generally. See just how great you can make your life! Get happy: buy it now! Happiness by Ace McCloud is the audio book that you need if you want to find happiness in your life! Some of the tips may be simple but let's be honest with ourselves, if you're a working man or woman, it's so easy to lose sight of the simple things in life...things that can help you be happier in just a couple of seconds. Just listening to this book made me start to feel happy again because I forgot so much about what mattered. Happiness is achievable using this book by Ace McCloud. Find tips you need to live the happy life you deserve. Learn to minimize stress, feel good and be happy-then make a habit of it! Happiness is a wonderful feeling that everyone wants and they don't realize they can MAKE it happen. You will learn how to set aside fear and become focused on the positive and happy things in life. There are some great strategies for long term happiness offers ideas to bolster your mind, body, and spirit. This is not your ordinary self-help book because Ace just gives you proven strategies to learn to get and STAY happy. Follow the step-by-step action plan for happiness and find your life changing in a painless and wonderful way. Get this book today and GET HAPPY! You won't regret it! Who Knew Happiness Could Be Found In A Book? Would you listen to Happiness: The Top 100 Best Ways to Feel Good & Be Happy again? Why? Absolutely. Happiness is a muscle that you have to exercise, and this book will help you do that. Being happy isn't something that just happens. Like anything worth having in life, you have to work for it. Luckily, there are helpful resources like these than can give us all the tools we need to be proud of ourselves. Remember that every minute you spend being dissatisfied is a minute you can never get back. Buy the book, what have you got to lose? I like audio books and I really like the fact that there are books on happiness and positive emotions that don't read (or sound) like a self-help type of book. I like the fact that people are interested in really knowing about happiness and finding it. 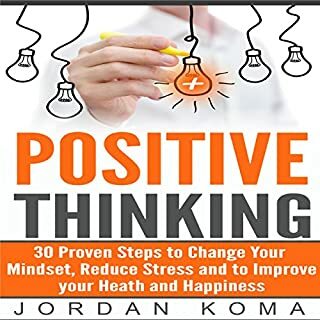 I try to do everything I can to help other people find positivity and happiness in their lives and this book is really good in finding other ways and methods to help them. I know I am a happy person myself and I like finding new ways to find happiness in this world. I recommend this book, not just for people who are desperate to find happiness in their lives but for people who have friends and relatives who need advice and help in finding happiness in their lives, too. If your looking for a way to increase your happiness and overall satisfaction with life, then this book is for you. This easy to understand book breaks happiness down into four categories: health, relationships, career and personal development. Life can get a little chaotic, especially with the busy lifestyles we all have today. But, by focusing on the good rather than the negative you can increase your happiness and stay happy. The step by step guide is an amazing transformation tool that teaches you how to squash the negativity. Get this book, it'll seriously change your perspective and boost your happiness. Where does Happiness: The Top 100 Best Ways to Feel Good & Be Happy rank among all the audiobooks you’ve listened to so far? It is up in the top 10 of nonfiction audio books. It has valuable information on how to become a happy person. What was one of the most memorable moments of Happiness: The Top 100 Best Ways to Feel Good & Be Happy? I especially liked the career tips that will bring more happiness at the job. It is all in the way you look at things and this book helps you to see there are good points about everything and you can make lemonade out of lemons that have been given to you. Sometimes my job gets stressful and the relationship with coworkers gets strained. I am a perfectionist and that is hard for some people to take. I cannot stand when someone does not give 120% to their job and the tips in the book helped me to at least deal with other coworkers and not get so angry and stressed out because someone wasn't doing their whole job. Joshua Mackey brings emphasis to things that need to be emphasized in the book. I might read it that way too, but when it is being read to you, you do not have to think about it. It just happens. I listen to audio books when I am doing mindless data entry at work, which is a small part of my job. Joshua Mackey seems to keep my attention better than most narrators because his voice is clear and sounds like he means what he is saying. The exercises in the book to help you be a more happy person will be remembered because they do work. I also enjoyed the step by step action plan to a happier life. It was easy to make my own and stick to it. I thought I was a relatively happy person before i read this book. I found that I might not have been as happy as I thought, but the book taught me how to become a genuinely happy person. I have let go of the control I thought i had to have and look at things from several different perspectives as the exercises in the book taught me and feel that I am truly happy most of the time now. This audio is jam packed with great ideas for increasing the happiness in your life. I had been feeling a bit depressed recently so thought I would check this out. I really liked the section on living life as an adventure. It also gave some great tips for being optimistic, living in the moment and tips for avoiding negative thinking. Everyone should listen to an audio like this at least once in their life! Find your happiness with this audiobook's help. Would you consider the audio edition of Happiness: The Top 100 Best Ways to Feel Good & Be Happy to be better than the print version? I believe it is better than the print version. This is due to Mr. Joshua Mackey performing the book as he performs each and every audiobook gracefully. No, but I did find the book to be very interesting and helpful. It is filled with many secrets that can help those who want to be happy become happy. This book really does help people find their happiness and lead a happy, positive life. Ace McCloud helps those who have been in a rut or faced depression learn to be happy and live a life worth living. This book is worth every cent and can truly help those whom need it. I highly recommend this book to those who want to truly be happy again. Good read with a positive message. There is so much power in having a positive and happy attitude on life. When you can find a way to live a happy life you will end up feeling stress-free, content and more people will want to be around you. 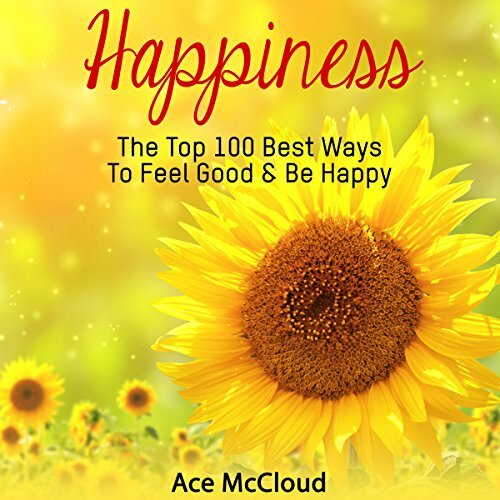 In this book, Happiness the Top 100 Best Ways to Feel Good & Be Happy, Ace McCloud will help you to become happy and STAY happy, which can be life changing! Being happy has many benefits! When you are happy you will be far less likely to experience feelings of stress, fear and anxiety. You'll feel a positive energy running through you which others will be able to feel and feed off of. People will also tend to treat you with more respect and be nicer to you when you have a happy attitude. I found this book on happiness to be very well written with powerful messages within the texts.Listening and taking in the information in this book can be life changing! I would recommend giving his book a listen because everyone deserves to be happy in life. With a little work and dedication, you could be the happy, positive person everyone wants to be around. 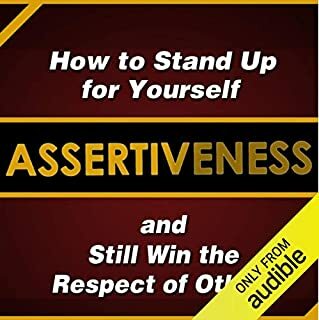 I am quite new to audio books and I am enjoying listening to the motivational works of Ace McCloud including this audio book. Josua Mackey is clear and enthusiastic and delivers the book well. . I particulary connected with the idea of "Finding your Purpose in Life" I like the focus on long term gain. Life is a marathon and not a sprint. Joshua Mackay was articulate throughout. He read with ease. There were no characters but different subject matters. Focusing on positivity and self belief reoccured like a mantra and was a powerful message for me. Being the best of yourself and loving yourself for it. The book covered a huge array of subject matter. It considered attitude to youself, your job, family and friends. It looked at thoughts, feelings and actions. An excellent overview of the many ways to approach change and as the author points out nearly half of our potential for happiness lies in our own ability to make this happen. I would absolutely recommend this audiobook to a friend. I've had this book about a week now and I've listened to it three times. It really does make a difference. The top 100 ways that it lists to get happy and feel good are easy to enact yet they make such a difference in your day-to-day life. I am happy, I have more gratitude, and my outlook on life has completely changed! I can't tell you how happy I am with this purchase. Need ways to improve your life, inside and out? Listen to this book! Happiness can seem like an elusive and sometimes fleeting life experience and often we look for it in all the wrong (external) places. This audiobook takes us on a journey to show us that happiness is something that we are (or become), not something that we find or that happens to us. Ace McCloud addresses the subject with his usual clarity and thoroughness, covering many aspects of life that we might not necessarily think of or pursue when learning happiness. A few thorny subjects such as forgiveness and stress are tackled along the way, but the big adventure is in becoming a person who builds happiness from the inside out, and not from extravagant living, material gain, becoming rich or finding someone else to "make us happy." This is an excellent audiobook, engagingly narrated by Joshua Mackey, and well worth a listen if you want to increase you experience of happiness. I really enjoyed the way that the author packs so many tips on happiness into one book so there's something for everyone. He covers four main areas but within each one I found so many tips I can work on. 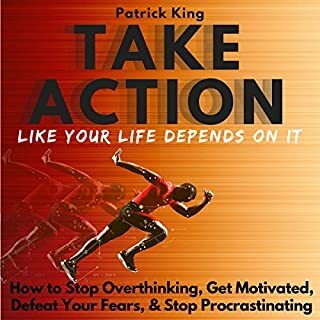 I found the book to be very motivating and inspiring as it went through various strategies to increase chances of happiness. The best part is that it doesn't just read like a generic self-help guide. The author does a great job of covering so many areas and using real-life examples to get across his points. Like his other narrations I have heard, Mackey delivered an excellent and engaging performance throughout the book. For me, I really enjoyed the section that focused on creating happiness through your career and the importance of many areas including avoiding negativity and taking responsibility. It really struck a chord with my and I am eager to put into practice some of the tips learnt. I was very impressed with this book on happiness. I highly recommend it as you will pick up some very useful tips that will help to you in life, whether it's in health, home life, your job or just your own attitude. Excellent! What could Ace McCloud have done to make this a more enjoyable book for you? What three words best describe Joshua Mackey’s performance? If you could play editor, what scene or scenes would you have cut from Happiness: The Top 100 Best Ways to Feel Good & Be Happy?